Our Quick Ship 2" Cordless Faux Wood Blind is the most affordable cordless faux wood we offer. This product comes with a PVC headrail. A durable mechanism raises and lower the blind when you raise or lower the bottom rail with your hand. Wand control for this blind is located on the left hand side allowing you to open and close the slats. There are no cords with this product making it incredibly child and pet safe. 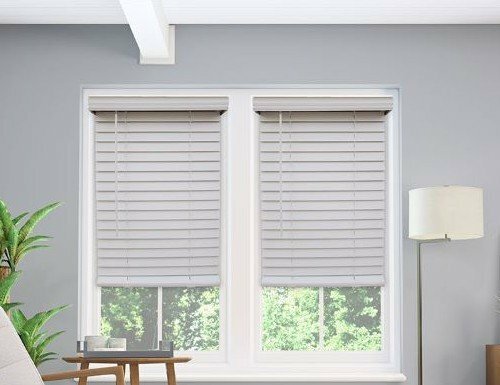 Only the highest quality materials are used to make sure this cordless faux wood blind will never warp, split, crack, or fade. The revolutionary hidden bracket system used with this blind provide a fantastic looking trim appearance. Our Quick Ship 2" Cordless Faux Wood Blinds is impervious to moisture. It can be used in kitchens, bathrooms, or any room in your home or office. This faux wood blind is also scratch resistant and simple to clean. To care for this blind simply dust or vacuum with your vacuums soft brush attachment. This product is environmentally sound. No depletion of vital forestland is required to manufacture this product. It is a durable, economical alternative to wood or metal blinds. W: 20" 21" 22" 23" 24" 25" 26" 27" 28" 29" 30" 31" 32" 33" 34" 35" 36" 37" 38" 39" 40" 41" 42" 43" 44" 45" 46" 47" 48" 49" 50" 51" 52" 53" 54" 55" 56" 57" 58" 59" 60" 61" 62" 63" 64" 65" 66" 67" 68" 69" 70" 71" 72" 0/0"1/8"1/4"3/8"1/2"5/8"3/4"7/8" H: 24" 25" 26" 27" 28" 29" 30" 31" 32" 33" 34" 35" 36" 37" 38" 39" 40" 41" 42" 43" 44" 45" 46" 47" 48" 49" 50" 51" 52" 53" 54" 55" 56" 57" 58" 59" 60" 61" 62" 63" 64" 65" 66" 67" 68" 69" 70" 71" 72" 73" 74" 0/0"1/8"1/4"3/8"1/2"5/8"3/4"7/8"